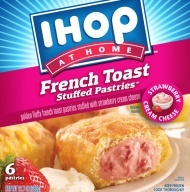 SAN DIEGO, CA: IHOP has set up a Facebook page to launch its IHOP at Home product line of eight different frozen breakfast meals, which is debuting in Wal-Mart. The restaurant chain, known for serving pancake entrees and other breakfast meals, introduced its Facebook page for the products Tuesday. It has also launched a unique IHOP at Home website and will be using traditional methods of promoting the products, such as coupons, free-standing inserts and media outreach to women's magazines and other publications including Sports Illustrated and Popular Mechanics. PR is being handled by Wills Communications in El Segundo, CA, which is spearheading the launch, and Firehouse in Dallas, which is dealing with Golden County Foods, the manufacturer of the meals for IHOP. IHOP spokesman Patrick Lenow declined to discuss the costs of the PR efforts, but said the first phase is a six-to-nine-week campaign to introduce the product line. He acknowledged that IHOP faces stiff competition from other frozen breakfast producers, such as Jimmy Dean and Kellogg's, which produces Eggo waffles. IHOP at Home meals will initially be sold in some 3,000 Wal-Mart stores throughout the country and eventually in other retail outlets, Lenow added.